N-Photo new issue on sale now! After all the rumours, hype and fanfare, the new Nikon Z7 full-frame mirrorless camera should be in the shops any day now. But should you be ditching your trusty DSLR for this newfangled mirror-free tech? We present over 100 facts and figures about the new Z system, plus give the Z7 the full review treatment. Talking of making radical changes to the way you approach your photography, we also see whether it’s time to move on from Photoshop, as we put 10 photo editors through their paces in our Big Test. Our Apprentice learns how to create a portfolio for a budding young actor under the guiding hand of Peter Bartlett, who specializes in portraiture for the theatrical industry. We speak with environmental photographer, film-maker and conservationist Aaron 'Bertie' Gekoski about his sometimes-disturbing wildlife images that lay bare human-animal conflict stories. We have a free copy of ON1 Effects 2018 – worth £60/$60 – for every N-Photo reader, and show you how to use it to apply stunning filter effects to your images in just a couple of clicks, as well as step-by-step tutorials on improving your shots in Adobe CC and Nikon's Capture NX-D software. And in our Nikon Skills section, we have a great project on shooting ’80s-style ‘neon’ portraits – all done with torches and plastic tubes. 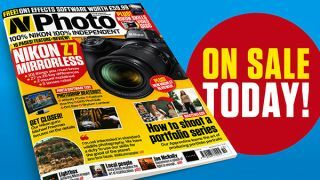 Plus we show you how to shoot underwater pool portraits, capture the colours of autumn, and use old film-era vintage lenses on your modern DSLR.